So were Sol and Mur. Shroud didn’t know how to take the news, even as he massaged his sore muscles and tried to gather his thoughts, Berserk wearing off. The floor felt cold like steel, and the world outside hostile, with the lights and sirens, constantly assaulting him. The organ-like pod had been ripped open behind him, its liquid flowing out. The sedatives still slowed him down, making his body sore and his mind slower. With his senses enhanced by Lightbringer, it became easy to distinguish his surroundings. His heart-like pod was only one among a dozen, empty others, linked to strange computer terminals by long cables. The entire area looked like a closed off medical wing, made entirely of metal and protected by reinforced steel doors. The Gearsmen were still busy fighting one another, raining fire on the other Organotech Hearts. While they paid no mind to Shroud, often preferring to hit themselves, and they had started a fire. With a look at the ceiling, Shroud noticed a large conduit above, enough to let a dragon like Smokefang fly through. It seemed they had left it open in case Evermarsh’s beloved dragon overlord had to come back. He also noticed small openings in the walls, pumping gas into the room. If Lightbringer allowed him to create light that remained solid as long as it was in contact with his body, perhaps he could replicate the tricks he achieved with Glass Field. With a thought, Shroud summoned a light replica of his glass armor over his skin, a bright, warm second skin. With a tweak, Shroud changed the color of the light into the darkest shade of purple, giving it the same shadowy look as his original suit. The light kept its solidness, and with some mental effort, the artificial suit lifted him above the ground. Without a word, Shroud flew through the open ceiling, following Smokefang’s lead, as toxic gas began to fill the hospital wing. His chest hurt due to his broken rib and Berserk’s effect waning off. While making his way upward, Shroud kept checking his account, finding a new icon next to the currently closed Lair feature, representing a blue banner with Earth on it. He checked the name, Guild Account, before clicking. A click on Sharpshoot’s account confirmed it as Maggie’s. Spellgun (Crimson Bullet): You can channel Red Flux through any gun, including fully formed Red spells. The longer you charge Red Flux, the more powerful the impact . Transfer / Suspend / Cancel? Shroud found himself checking Perse’s Network feed, driven by a small, impossible hope. He found her in a hospital room, attended by a soulless automated machine assistant. The sorcerer hesitated before clicking on the contact option; before realizing this may be the last time he could speak to her, whether he succeeded or failed in his escape. “It’s me. I’m talking through…” he struggled to find the right word. “I don’t want to talk about Dad,” he cut her off. He didn’t want sympathy, he didn’t want kindness. He just wanted payback. “I’m a spellcaster,” he admitted. “I have been for a while. And I can give you and Ulysses the same power as mine. We could become a party like you suggested.” That sounded like years ago. That hit him harder than it should have. “But what?” his voice broke inside his throat. “A month,” he replied, his voice lower than before. He couldn’t blame her for the way she felt. He had dared tell Sol because he trusted him more; because he knew the priest would support him, join the fight. He hadn’t had the same confidence in Perse, or in his own father. He could only blame himself. A lie cannot live, a wise man once said. Perse didn’t answer. That alone was a warning. He didn’t need Network to guess why. “You take care, too,” she replied with the same finality as him. She felt she wouldn’t see him again. The hollowed pillar went on and on, an endless tunnel adorned with smaller alcoves, smaller conduits leading into windows; past them, Shroud could see apartments, machine rooms, and hints of floral biodomes. 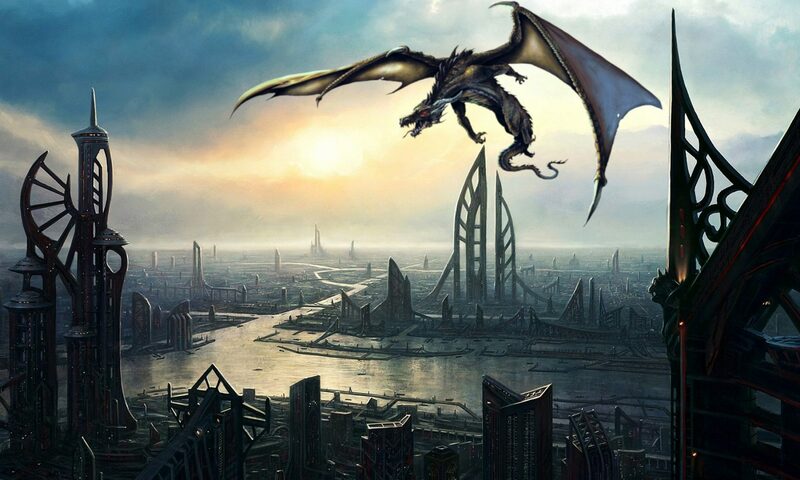 Windows meant to allow the dragons to look at any area of the artificial city, like a panopticon. “Glass Field,” he spoke softly, letting his magic flare back to life. As Shroud mentally shattered the glass around him, he allowed himself a thin smile. How good it felt, to see again, to sense the power surge within his very bones, to be more than a helpless victim. After getting used to his magical senses, Shroud had never understood how much he enjoyed them until now. A storm of shrapnel surrounded him; a few he incorporated into his light armor, creating a second, protective layer. The others flew around him like a flock of birds. Shroud checked if he could channel Lightbringer through his glass, and to his delight, the glass responded. With a thought, he coated each shard with the same solid light as his armor. To outsiders, he must have looked like a bright sun surrounded by countless, miniature stars. A squad of Gearsmen came down to greet him, firing on sight while keeping their distance. Their beams fell upon him like a red, bloody rain. With a thought, Shroud placed a few shards in the way, and tried to channel Lightbringer. If he could cast spells through them, then perhaps they counted as an extension of his body for the Hack’s purpose, allowing him to create light constructs around glass. It worked. His lightshards expanded into a beehive-like colored shield, stopping the Red Flux beams. Lightshards. He liked the name. A hundred other shards, he turned into the light swords he had used before, shredding the machines with a volley of them. Gears and blood fell down the pillar, while Shroud remained immaculate and clean. Now that he had a stronger, faster offense, he could retaliate without needing Sol or the others. He should have relished at the sight, taken joy in his act. Yet he only felt numb, as cold and lifeless as the steel around him. Unfortunately, the intelligence ruling the complex took his counterattack as a warning. As the air sirens increased in shrieking potency, reinforced doors began to close above his head, barring his way. Shroud unleashed his swords of light at them, but they failed to pierce the barriers. In fact, small holes opened in the conduit around him, revealing automated turrets. They pointed at him and started firing red beams, while other holes released gas in the hollowed pillar. Unable to progress, Shroud had no choice but escape through one of the broken windows with his lightshards, leaving the conduit behind for another area. The second he stepped out of the alcove, a Gearsman flew at him at full speed, intent on tackling him. Hearing it coming, Shroud sent his lightshards to tear it apart in a rain of gears and white blood. He found himself above a giant, closed park rivaling the size of New York’s central park. Powerful lamps provided the light above, while the giant walls around revealed stairs to apartments. The green expanse had everything a park could wish for, from a lake to game spaces for children, or even golf courses. Concordia built the Arc-Cities to welcome entire populations there; each of these hives could survive in perfect self-sufficiency, feeding the population, keeping them safe from danger. Giving people all they needed. New Gearsmen, a full platoon of twenty this time, flew out of the hidden compartments inside the park to attack him. All of them carried strange, rough-looking two-hand cannons and rifles, firing volleys of orange colored rounds at him. Each colored bullet, Shroud could predict the trajectory. While he couldn’t see the shots, he noticed the precursory triggers and adjusted his position in time; in fact, he noticed everything. Each turn of the Gearsmen’s fingers, each movement in the air. His brain could take it all with Premium Thoughts. Carefully, Shroud moved away while putting a lightshield between himself and the projectiles. As he feared, the orange bullets pierced his shield, narrowingly missing him. They had adapted to his defenses and upgraded their weaponry. Once again, Shroud retaliated with a volley of lightshards, but the Gearsmen dispersed into groups of four to avoid his counterattack. Still, thanks to Premium Thoughts, he found no difficulty handling them while opening another Network feed. “Ulysses?” he called while dodging orange flux bullets. Some parts of the walls around the park slide away, revealing turrets. They joined the Gearsmen in bombarding him from all directions. Accelerating his flight speed, Shroud struggled against a sea of projectiles, creating layers upon layers of protective light shaped like beehive combs. Shroud gathered all lightshards around himself. The bombardment left him no opening to fire back, trapping him. Nowhere to run, no opening. Mathias thought back about Maxwell’s deal. Swallow his pride, surrender, submit to better strike back later? Maybe that was what Maxwell was doing, playing the long game. He could keep his friends, negotiate the safety of his team. His eyes glanced at the shield of light around him. No. Magik Online would never risk discovery; the Empire had mind-readers in its employ, and they would interrogate him thoroughly. The Administrator would take his power, perhaps even silence him. He had put all his chips on the table long. He couldn’t fold anymore, only raise. Shroud cut off the communication, clenched his fists, and let out a scream of rage and sorrow. Each of his shards reverberated the sound, amplifying the spell’s reach through the entire park. The pressure on his shields subsided, yet the machines kept the same firing speed; except now they fired at each other, UB controlled turrets taking down Gearsmen, orange bullets raining on the trees below. Half the lamps above Shroud’s head shattered with a loud, strident sound, casting half of the biodome into darkness. A few Gearsmen even started attacking themselves, ripping out their heads or shooting themselves in their madness. Protected by his barrier, Shroud watched the machine civil war, his shields protecting him from the rare stray shot. The malfunctions had spread to other, subtler systems; the apartments’ doors opened and closed at random, an electrical fire spread through the park, and the lake began to steam up. Shroud wondered if Mad World’s effects were only limited to the Arc-City, or if it affected all of Evermarsh. Suddenly, without a loud sound, the battle ended as suddenly as it started. The lamps went out, leaving only Shroud’s light and the fires below to keep it alight; the Gearsmen suddenly fell inactive, falling to the ground like dead birds. The turrets stopped firing. All the systems maintaining the city had shut down. A reboot. He had forced a reboot on the city’s central UB to deal with Mad World. Shroud immediately took the opportunity to fire lasers at the inactive Gearsmen and turrets, demolishing them before they could wake up. Hundreds, thousands of lasers, bombarding the walls, the turrets, the trees, and the dirt. No spot, no area was left untouched by the onslaught. Gearsmen were torn apart, turrets exploded, and the lake turned to steam. He sustained the attack for a full two minutes until all he could hear was the sound of his beams melting metal. Only then did he stop. By now, the park below had caught fire at a dozen spots, trees burning and flames spreading across the grass. The lake had lost a good chunk of its surface, covered by steamy mist. The broken remains of Gearsmen and turrets laid on the ground, while the walls around were damaged beyond repair. Some apartments had crumbled, causing one block to collapse on the left. An anti-fire system should have activated, yet the city’s reboot left the flames to spread unchecked. Shroud looked at the devastation, with a strange mix of loneliness and satisfaction. He had lost a lot today, yet found some comfort in the fact he could still fight. He wondered if he could steal the city’s UB since he had disabled its defense. With a powerful tremor, a whole side of the park ripped itself in half, metal plates beneath the dirt and the trees tossed aside to reveal a large, dark tunnel below. A scent of sulfur and brimstone rose to fill the air as if a gate to Hell had opened. The beast left its den in short order, taking its flight among the smoke. A giant, winged fiend whose scales shone bright and strong. The monster let out a roar, as it moved above the sorcerer in contempt. Smokefang looked down on Shroud, casting his light in its immense, winged shadow. His lone eye burned with malice and a desire for revenge matching the sorcerer’s own. Smokefang answered with a cloud of smoke and green fire. A/N: Great news, my patron Dax set up a Magik Online Discord server, which you can check out by clicking on this link (https://discord.gg/WJgGAfc) if you wish to chill out and discuss the story. I’ll probably add a FAQ part at some point to answer questions. Thanks to my beloved patrons, Rhodri Thornber, Drekin, Bald Guy Dennis, Karolus, Dax, Sam, Floodtalon and Daniel Zogbi. And double thanks to Dax for setting up the discord server.